They say 2016 is the year of the monkey but every mama around knows better. The only beast that's come to visit this year is LA GRIPPE: the flu, the cold, the vomiting snotty misery that transforms our little gremlins into small germ-carrying heat-seeking missiles. It wouldn't be so bad if there were just ONE round of illness, but no. Strep, Hand-Foot-and-Mouth, fevers, and rashes lurk around every corner. Church. Daycare. Preschool. The pool. The library. No one is immune. Possibly the trickiest situation to navigate in the Mommyhood during flu season is the playdate. This typically care-free activity is a landmine of faux-pas and unfriending waiting to happen. 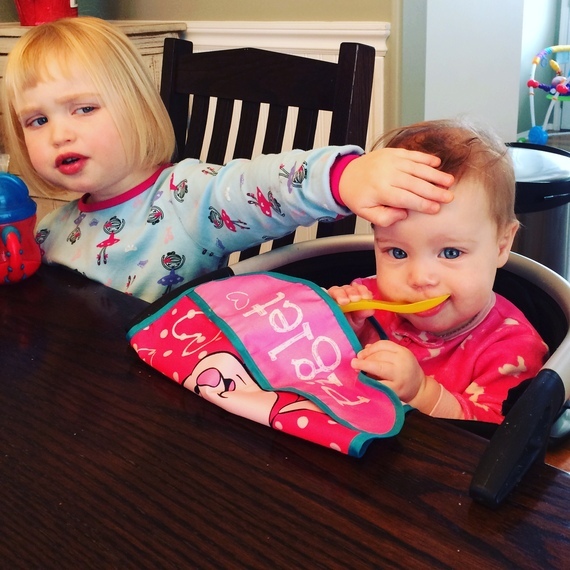 Here are 5 Easy Steps to Navigating a Playdate During Flu Season. Little Johnny has the sniffles. Before you toss him into the birthday party fray, consider the following: How many cups of coffee has birthday girl's mom tossed back today? Does she have that "on the edge" look? Any recent thinly-veiled Facebook updates about not being able to take it anymore? Is she waving a clothing-steamer violently to mass diffuse essential oils? Are Lysol wipes her main decorative theme? Maybe reschedule. There's always next year. 2. Always bring a gift. Sometimes you show up with snacks or maybe a book. This month, how about hand sanitizer? Sure, the Wal-Mart cashier's starting to glance at you warily as you purchase your fifteenth straight bottle, but she doesn't understand. You're NOT drinking it, but you can't say you haven't considered it. Casually text your friend and drop the "my kid might have the sniffles" card. Now wait. This is the mom "release of liability" form. If your friend brushes this off and their kids get sick, LIFE IS A SERIES OF CHOICES. If you're a parent, you already have your own germ-collecting minions. Never ever open your home to more of them. I know you're always hearing things about being hospitable, creating a welcoming space, blah blah blah. Lock your doors. Close the blinds. We'll come to you. It's NO problem. Your kids are looking a little subdued, but they aren't puking, sobbing, or feverish. Mentally review all the places they have been subjected to the possibility of illness. The indoor play park. The grocery store. Tuesdays. Sure, your friend's six children are now out of commission, but be strong. Repeat after me: "It snot my fault." Bio: Even after teaching high school French and English for the last six years, Abbie still decided to have her own kids. A self-professed mombie of two littles, she locks herself in the bathroom to therapeutically journal about mom life, mom fails, and faith from behind her mom goggles in the heart of winter, Saskatoon, Canada. Follow along or offer professional help at her blog, Facebook, Instagram, and Twitter.